RELEASING a year or so on from his solo and ensemble recordings Song Singular and Step Wide, Step Deep, Oxford-born avant-garde pianist and composer Alexander Hawkins’ new album approaches arguably that most classic of jazz line-ups – the piano trio – with colleagues Neil Charles (double bass) and Tom Skinner (drums, percussion). Having received various commissions in recent years (including the BBC), Alexander Hawkins is increasingly establishing his name on the circuit, both as leader and sideman. But here, for the uninitiated, the distinctly minimalist CD sleeve offers no clue as to the sound world which lies within, save perhaps for the qualities of openness and experimentalism which form the basis of Hawkins’ projects. And, although his many influences include Mingus, Ellington and even Nat King Cole, this is not such a familiar, steady-tempoed, tonal landscape. Indeed, the pianist explains that he had previously “shied away from the trio format because there’s so much luggage that comes with it”; but whilst there may be an initial, perceived randomness to these eight works, he is an authority on the history of the piano trio format and favours the traditional attributes of his companions – a bassist who plays low and woody, and a drummer whose principal focus is rhythm. Subtle Ellingtonian big band auras fleet like glints of sunlight across this recording, heard in opening Sweet Duke which rattles to Tom Skinner’s lively ‘I’m an Old Cowhand’-style drums and the swagger of Charles’ bass, whilst Hawkins’ bright, hard-hewn chords buck wildly. Song Singular (Owl, Canon)‘s dramatic breadth seems to capture the essence of this trio: acres in which to improvise freely, yet always attuned to a holistic purpose – bluesy riffs, ostinato phrases and skittering percussion all contributing to its grandeur. Lurching tricksily and accurately, One Tree Found employs the band’s frequent unison deportment to great, even frivolous, effect; and Perhaps 5 Or 6 Different Colours enjoys greater freedoms, Hawkins’ jarring chords and glissandi combining well with the abruptness of bass and drums – and, as the title suggests, the variegated episodes here add to the fascination. Resembling animated conversation, 40Hb finds all three players interacting closely, Hawkins’ piano voice taking a ‘brassy’ lead, dedicated as it is to cornetist (his colleague in The Convergence Quartet) Taylor Ho Bynum; and sparse, misterioso Ahra – mostly a piano solo, but then with delicate augmentation from Charles and Skinner – is quietly an album highlight. Hawkins’ dendrological interest continues with sprawling Baobabs (Sgra), a ten-minute slow-maturing of shifting ideas which is entrancing in its intricacy. And Blue Notes For A Blue Note (Joy To You) appears to meld Ellington and Monk in its straining-at-the-leash exuberance, Hawkins offering luscious chords amongst Skinner’s thunderous drum-led close. It’s not impossible that Hawkins’ surface atonality might prove difficult for some. But I sincerely recommend the challenge here of gradually unlocking the seemingly abstract to discover and appreciate this fresh piano trio expression comprising order, collaboration and abandonment. Patulis auribus! 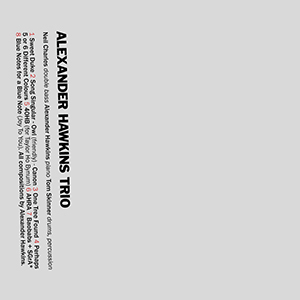 Released on 13 April 2015, the eponymously-titled, self-released Alexander Hawkins Trio is available from Bandcamp and all good jazz stockists.